If you don't feel like clicking through to that article, I'll just briefly explain the essence of the event. 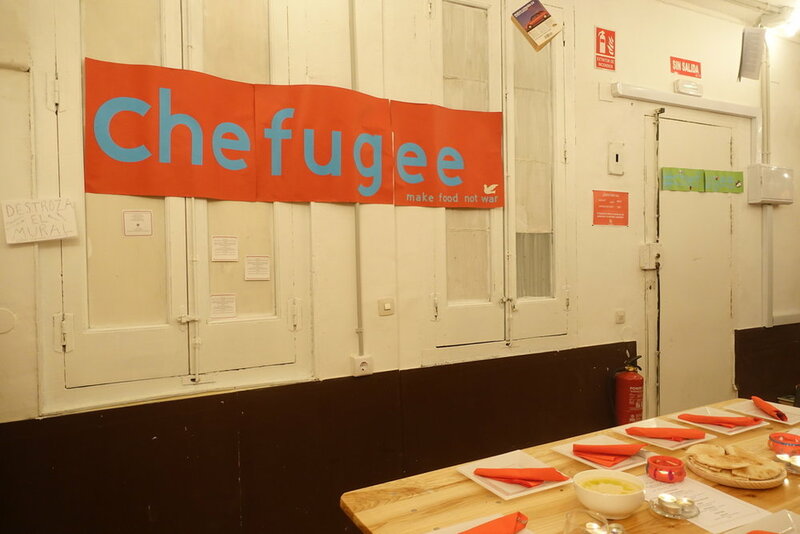 Chefugee is a pop-up dinner put on by the organization Madrid for Refugees (MFR). Dinners are cooked by individuals who are not only refugees, but also chefs, and are hosted in a variety of places around the city. Many different countries and cultures have been represented at Chefugee events, and through the funds raised at the dinners, many refugees have been supported as they adjust to their new lives in Madrid. It's also a great way for the chefs to get paid doing work that they love, and to gain professional exposure. Read more on the MFR website here. We attended our first Chefugee dinner in the fall of 2016, not long after I read that first article. It took place in a home in northern Madrid, and our cooks were from Ukraine. Overall, I think the food wasn't our favorite, but we met and talked with a host of interesting people, were moved by the stories of the chefs who had endured so much, not only in starting over with nothing in Madrid, but also in the past few years in Ukraine. Another blogger wrote about it well here, and I even spotted Danny's back in one of the photos! Shortly after this dinner, we began volunteering with MFR, and continued to do so for all of last school year. This Chefugee took place at a French/Japanese restaurant and the format of the event was very different from all of the others we've attended. Aside from the fact that we'd paid in advance, it was essentially like we were out to eat, but with a preselected menu made by a Syrian chef. We were given a starter to share, a couple of main dishes (including a last-minute vegetarian substitution for me! ), and dessert, and everything was great. I've mentioned it before, but we don't go out to eat much, so while we missed chatting around the table with different folks, it felt like a special meal out, but for a really good cause. In the past few weeks, we've been to two more Chefugee dinners, both of which were hosted at a bookstore in the Lavapiés area of Madrid. Both meals were served family-style, and both were cooked by chefs from Syria, one from the city of Hama, and one from Aleppo. Samira, the chef from Aleppo, had come to Madrid from Syria within the past few months with her husband and son. It was clear that the Chefugee experience was a very emotional one for her. Although both meals were Syrian, they were quite different (but tasty, of course! ), and as is becoming a theme, we sat at tables of fascinating, smart people from all over the globe. Even us early birds found the clock striking twelve before we were able to convince ourselves to leave the warmth and fun. Many of us have heard stories about what it's like to be a refugee, whether in a country in conflict or after moving to a new one, but every story and every life is different. Danny and I have moved to Madrid out of choice - we wanted to try and learn new things, whether that be a job, a language and culture, or different perspectives. As we've learned, not everyone has that luxury. Most refugees leave their homes in the midst of chaos and danger, and go wherever they can find safety, often with next to nothing. In our comfort and routine, it's good for us to remember that the news is real, that refugees are struggling, and that we can help.